Of course lots of a rain in a very short period of time doesn't have the same effect as gentle rains over a longer period of time. However, in the drought-parched West, we'll take any rain we can get! Another month is at a close so it is time to tally up the precipitation and see were Canebas Weather Station is at with respect to normal. Alas the news isn't so good. December has been unusually cool and dry. Storms have been few and not as "juicy" with the exception of one atmospheric river event. As a result we only received 2.66" of rain (67.6 mm.) That is only 75% of the normal rainfall for December. 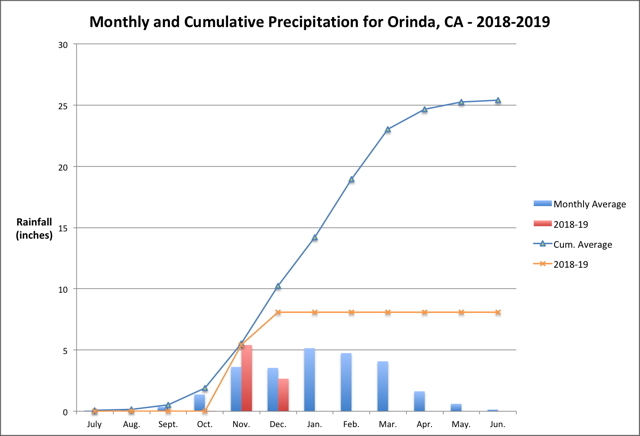 Because December is an important rainfall month in Northern California, the cumulative numbers are also hurting. We are down to only 79% of what would be to date a normal season. The shortfall isn't to extreme yet, but the overall trend is disturbingly similar to recent years. 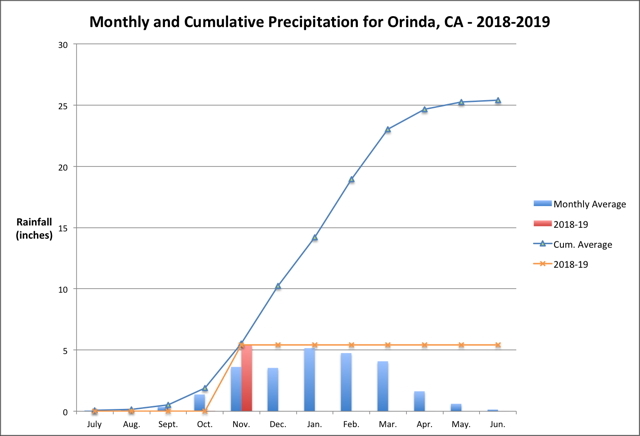 Instead of rain falling steadily throughout the wet season, we are increasingly reliant on atmospheric river events to bring extreme rains in short periods of time. 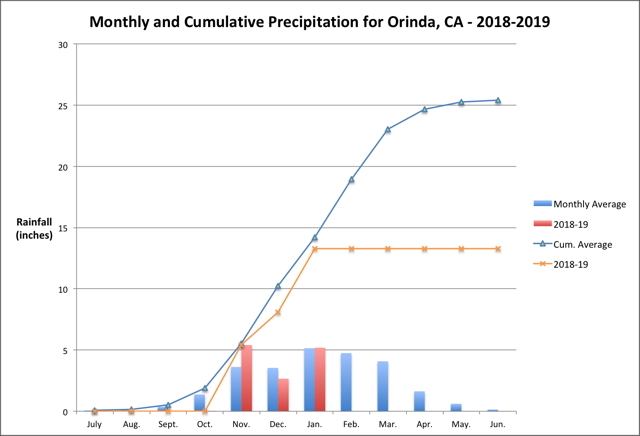 This trend has resulted in more rain during the mid-seasons and less during the middle of winter when California normally receives the bulk of its rains. January is a new month of a new year. The Climate Prediction Center medium range forecasts are the moment encouraging. Alas, the drought worries are definitely back. Another month is at a close so it is time to tally up the precipitation and see were Canebas Weather Station is at with respect to normal. January has been kinder to us. We picked up a small amount of rain overnight and that was enough to bring over normal for the month: 101% !! 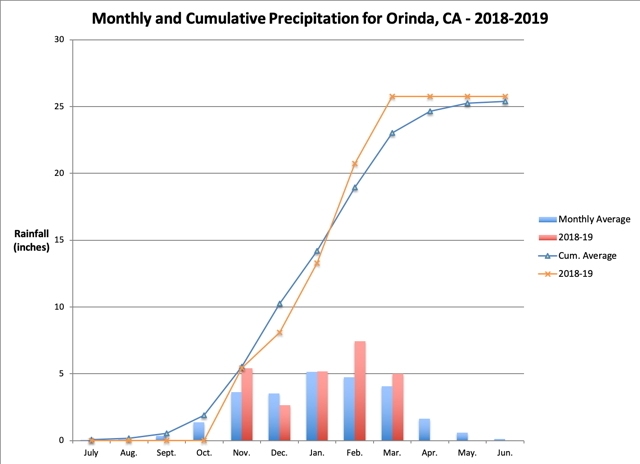 Since January is one of our wettest months, getting the normal rainfall had a positive effect on the cumulative totals. We are now caught up to 94% of what we could normally through the end of January. More rain is expected for the start of Feburary so for the moment we are looking at what will hopefully be a rationing free year for the second year in a row. 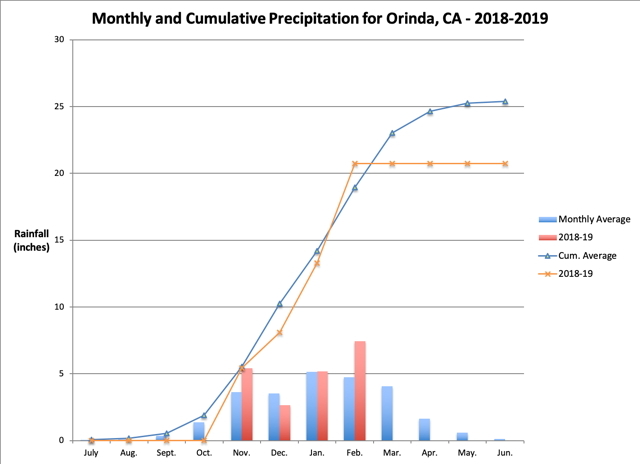 Re: Monthly reports for the Northern California 2018-19 rainy season. Good news for the drought, and we could use some good news on that subject. As can be seen on the cumulative graph, we are caught up but not by all that much - 109%. So we shall need the rains to keep coming to avoid falling back behind in the spring. Your February rain was welcome news here in the mountains of northern Utah, where it turned into 61 inches of snow (s far). It's snowing right now, but it remains toi be seen whether or not it will turn out to be measurable. Until I get my Reinhard & Son Electronic Snow Measuring Device, I'm still using a metal yardstick. unless I could figure a wireless way to heat the rain collection cone on the Davis? It seems just about certain that we shall pick up some more rain next week and perhaps even the week after. At this point the benefit isn't the additional moisture, but prolonging the period before Californian's have to start watering once more. There is no substitute for watering by none other than mother nature!